Finally! 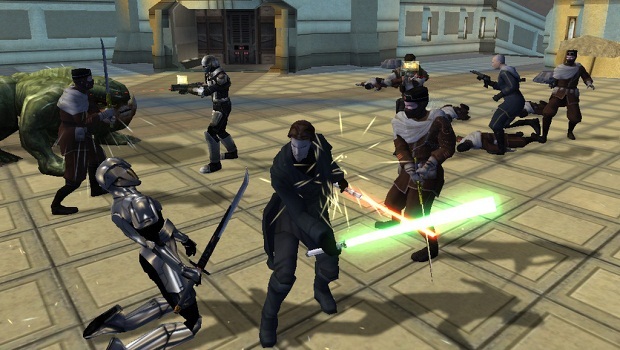 As much as I enjoyed the original Knights of the Old Republic, it was its much-maligned sequel that I felt a greater connection to. Considering my Xbox copy is residing overseas, it's handy that KOTOR II - The Sith Lords is now available on Steam. I can't remember having too many problems, despite the game's buggy reputation, but that rushed ending (or lack thereof) still rankles. Considering the recent, final release of the full Sith Lords Restored Content mod, this looks to be a great time to get back into the Ebon Hawk and meet up with HK-47 again. The game will cost £6.99/$9.99 and is well worth it, especially if you're wondering what the Old Republic was like before it moved into MMO-land.